APPEARANCE: Kanashibari is the Japanese term for sleep paralysis, a phenomenon when REM sleep overlaps with waking consciousness. The victim’s body is still paralyzed in sleep, but the eyes are open and the mind is half-awake; and the real and dream worlds mix together. Stories about kanashibari go back all the way to ancient times, and it was attributed to a supernatural force enacted upon the body. There are a number of legends about kanashibari, and each one points at a different cause. ORIGIN: The most common form of kanashibari comes from possession. When a person is possessed by inugami, kitsune, tanuki, or other kinds of tsukimono, one of the possible symptoms they can develop is immobility or sleep paralysis. This sort of possession could sometimes be overcome if a shugenja — a kind of priest — recited Buddhist sutras to drive out the possessing animal spirit. Once the spirit was driven out, the kanashibari would disappear, and all would be well again. Other kinds of yokai can inflict kanashibari. 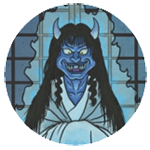 The makura-gaeshi, a kind of zashiki-warashi from Ishikawa prefecture, haunts rooms at night, flipping over the pillows of the sleeping inhabitants. Victims sometimes wake up in the middle of the night, feeling a crushing weight on their chest, and find the ghost of a small child sitting on them. This can occur sporadically, or even every night, depending on the mood of the makura-gaeshi. Though not actually harmful, this is a terrifying experience for the victim. Kanashibari can even be caused by humans — usually priests or sorcerers. The tale of Kiyohime features one passage where the jealous princess is chasing after her lover, Anchin. Trying to escape her advances, Anchin asks the priest at a Kumano shrine for help, and they are able to trap Kiyohime in kanashibari, giving Anchin time to flee. Finally, kanashibari can be caused by ghosts. A famous account comes from a popular ghost story in Iwate prefecture. There are many variations, but generally what happens is this: during the middle of the night, a person wakes up with an ominous, foreboding sense of dread. He (or she) realizes that he can’t move, even though he is wide awake. It feels like powerful arms are gripping him tight, keeping him immobile. Suddenly, an invisible force tugs on his legs and drags him out from under his futon — usually in the direction of an open window, or a river, or some other dangerous place! After a desperate struggle, he finally snaps out of the sleep paralysis, and sees the ghost of a middle aged woman rising up into the ceiling.